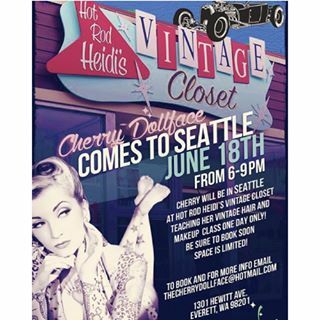 This past June, Miss Kitty and I had the absolute pleasure of attending Cherry Dollface's Vintage Hair and Makeup Class at Hot Rod Heidi's Vintage Closet! It was amazing and we couldn't be more grateful to Cherry and Heidi for this event! Miss Kitty and I learned quite a bit at Cherry's class! 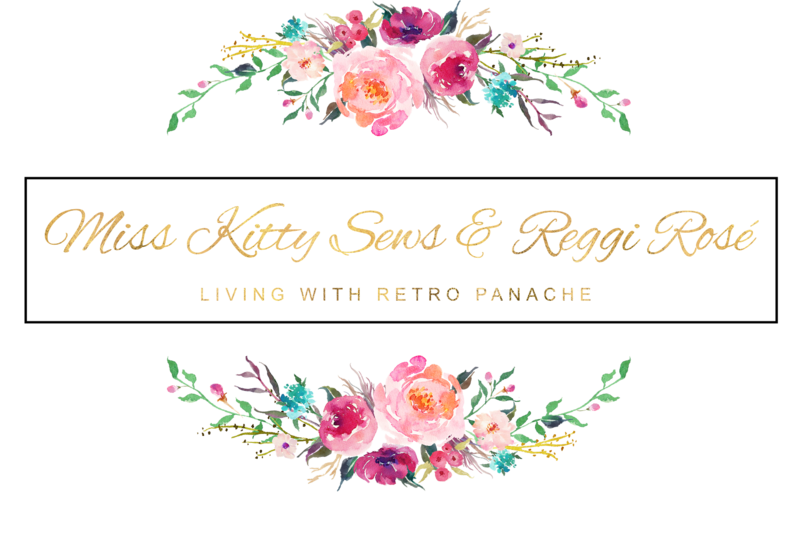 More than I expected; we watch so many YouTube videos, read so many books and articles, and follow so many Vintage babes that we thought we knew our fair share about vintage beauty and hair... but, seeing it live put it all into a new perspective! Plus, Cherry is just amazing... her humor and wit made the whole event that much more amazing! We're sharing our notes and pics from the event with you, our lovely readers, in hopes that we can spread the Cherry wisdom across the interwebs! Our first stop in Everett? ...Starbucks, of course! Like true Seattleites, we arrived early to ensure we could grab a cup of joe and a snack before the big event. The cutest cookie EVER, from Starbucks! Miss Kitty and Reggi, just before the class. Hair: first attempt at a Dita Bun... I have too much hair, lol! Reggi and Miss Kitty just before the start of the class.... we're so excited! Despite being early, we headed to Hot Rod Heidi's Vintage Closet right after Starbucks. Luckily, the store was open and guests were welcome to sit and hangout with Cherry while she prepped her models and her station!! We were able to chit-chat with Heidi and Cherry; both women are darling, friendly, and just plain fun! Hot Rod Heidi just before the start of the class. Isn't she just a babe!? Cherry Dollface prepping her model's hair with pin curls. Just look at the skirt that she's wearing!! GORGEOUS! Class started with introductions and the agenda. There was a packed house! Well, a packed store! From what I could see, all the ladies were ready with pen and paper eager to capture all the tips and tricks that Cherry could teach them; Miss Kitty and I were no exceptions! How to create "3D brows": add a line under your brow that is one shade darker than your brow color! This will make your brows appear more lifted and fuller. don't apply the false eyelashes starting on the inner corner. This makes you look more doll-like and fake. doing this will get any excess lipstick off that would otherwise be on your teeth. for an even longer wear, apply multiple layers of lip liner before applying lipstick. Use a soft-bristled brush to smooth out the outside portions of the teased sections; do not comb out your tease. Cherry recommended using duck-bill clips with rubber guards so as to prevent creases in your hair (see pic below of the pink duck-bill guard). Cherry Dollface while applying Bomber Betty's Brow Wow and Brow Pomade. Cherry Dollface applying the top line of eyeliner; using The Balm Schwing Eyeliner. After the top eyeliner line is drawn, before she filled it in to the lash line. Cherry Dollface applying lip liner. After finger-combing through the model's pin-curled hair, Cherry sectioned off the crown and started teasing. Ta da!! Doesn't she look fabulous! That tease has some height! Cherry's recommended duck-bill clips with rubber guard. Cherry, working some curls and victory rolls on her model, aka Heidi's sister! If you're ever able to go to Cherry's class, do yourself a huge favor and go! You won't regret it! I hope you found our notes and pics helpful, fun, and useful! Until next time, lovelies!